There seems to be no end in sight for Vancouverites hoping for more affordable housing. Vancouver condo prices are accelerating by about 2% each month, while renting isn’t getting any cheaper. 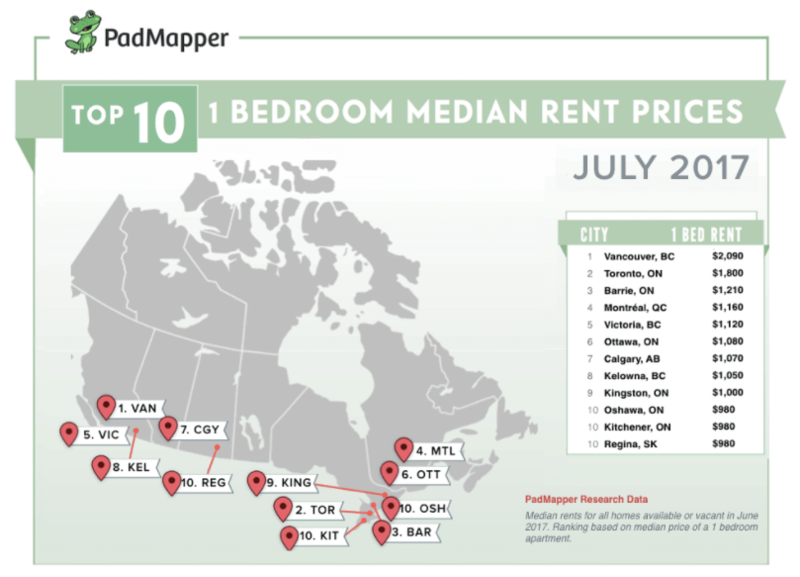 According to PadMapper Vancouver was the most expensive city to rent in Canada. In June the median rent price for one bedroom units grew by 2.5%, settling at $2,090, while the median rent price for two bedrooms increased by 2.5% to $3,230. While rent prices have been increasing, they haven’t been able to keep pace with purchase prices. Hardly surprising since you can’t take out a mortgage to pay for rent, therefor rents tend to align much closer to local incomes. Here’s how the price to rent ratio’s shake up in Vancouver compared to a couple big time US cities that Vancouverites love to compare to. Price-to-Rent Ratio of 15 or less: Buying a home is a better deal than renting for people planning to live in a home for at least five years. However, if the buyer is planning to live the home for less than five years, buying could be a better deal if the index is 10 or less, depending on moving and closing costs. Price-to-Rent Ratio of 15 to 20: Renting or buying a home could be a better deal, depending on a prospective homebuyer’s tax bracket and if they plan to itemize their tax deductions. Price-to-Rent Ratio of 20 or more: Renting is a better deal than buying a home, except for people planning to live in a home a very long time (fifteen years or more). While we may have dethroned San Francisco, prices still have a ways to go before dethroning New York.. But then of course even comparing New York to Vancouver is quite ridiculous, considering New York has a GDP of roughly $1.5 trillion which is the equivalent to the entire Canadian economy.